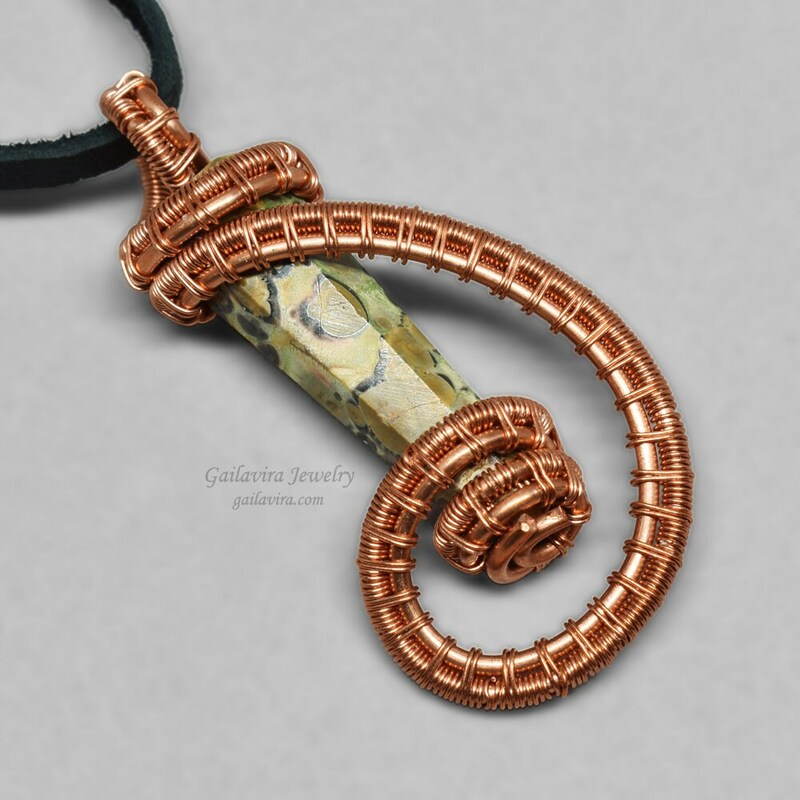 Earthy shades of brown, cream and hints of yellow and cream on a Leopardskin Jasper crystal point, surrounded in a swirl of woven copper wire. 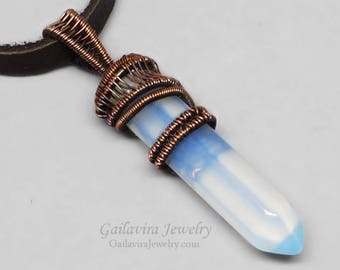 Pendant hangs from a black leather necklace. 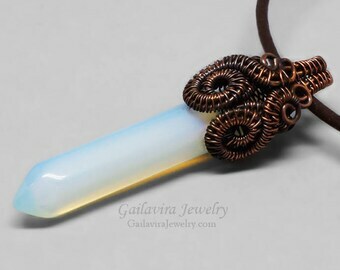 Pendant is approximately 2 1/2" (63mm) wide and 1 7/8" (48mm) long. Black leather double strand necklace is approximately 1" (55cm) long. 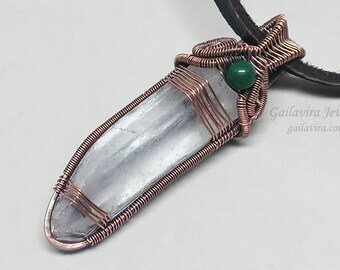 Gorgeous crystal wrapped pendant. Exceptional work! Love it. Absolutely gorgeous necklace arrived today! Thank you, Donna. 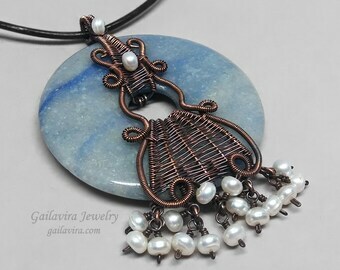 Pretty pendant beautifully wrapped! Thank you very much. Your order will ship ONLY to the address listed in paypal. If you need to ship to an address that is not currently listed in your papal account, please add the address to your account before purchasing (you can add multiple shipping addresses to your paypal account. Please see the paypal website for more information). No items will ship before payment has been made and cleared through paypal. If you have paid for your purchase using an e-check, your items will ship after the e-check has cleared. For information on paying using an e-check, please see the paypal web-site. Your order will only ship to the address given at the time the item was purchased. There will be a 7.25% sales tax fee added to the total cost of your order. I will only give refunds if an item is found to be defective. If it is not an item I can repair or re-create I will offer either store credit or a refund, customer's choice. You will have up to 7 days after the original shipping date (14 days for international orders) to return an item. You must contact me (you can use the contact link at the right hand side of this page) before returning merchandise. I will accept returns only if there are no obvious signs of abuse to the item in question. If it appears the item has been abused in any way I will return the item to the customer AS IS. If you wish to return an item that is not defective store credit will be given for the item cost only. All orders are shipped for the fee listed in the item page. Packages with a total value of $150 or more will be insured for free. If your order is for less than $150, and you would like your package shipped with insurance, please contact me by using the contact link at the right hand side of this page. I will send you a revised invoice with the cost of postal insurance added to your order total. To cut down expenses orders are only shipped twice a week (except during the holiday season, at which time orders are shipped daily on a first come first served basis for all 4 of my etsy shops combined). Sales in my shop do not extend to custom orders. Custom orders based on designs that are already listed for sale will be estimated according to the original retail price of the item, not the sale price or clearance price. Custom orders and items listed in shop as made to order may take up to two weeks to ship after payment is made. These items are made on a first come first served basis for all 4 of my etsy shops combined. **NOTE** Due to the holiday season, custom orders are closed until January 2, 2019.